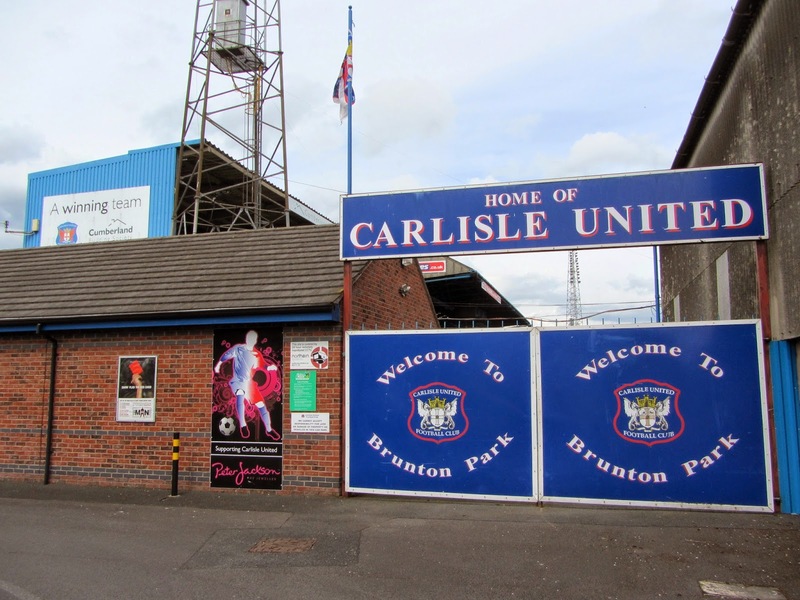 My tenth stadium of 2014 was on Saturday 26th April at Brunton Park in Carlisle, Cumbria. 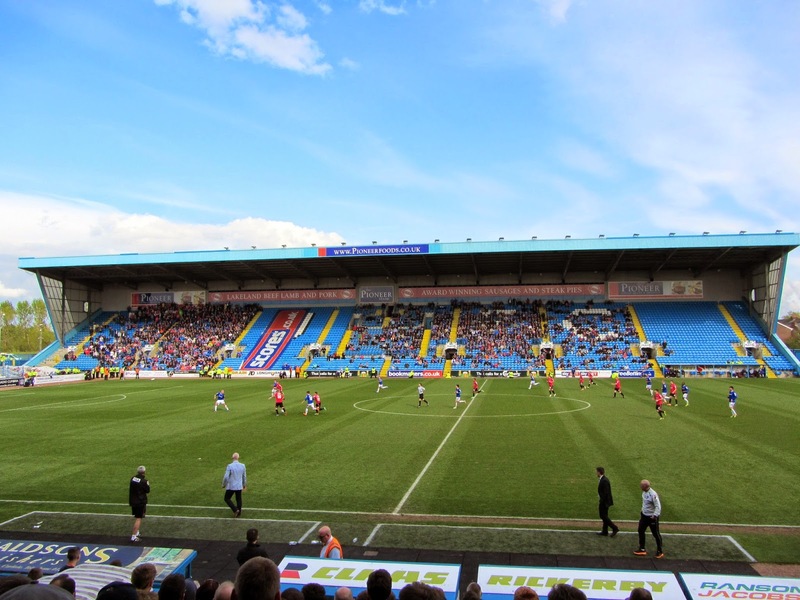 The match was Carlisle United vs. Oldham Athletic in Football League One. 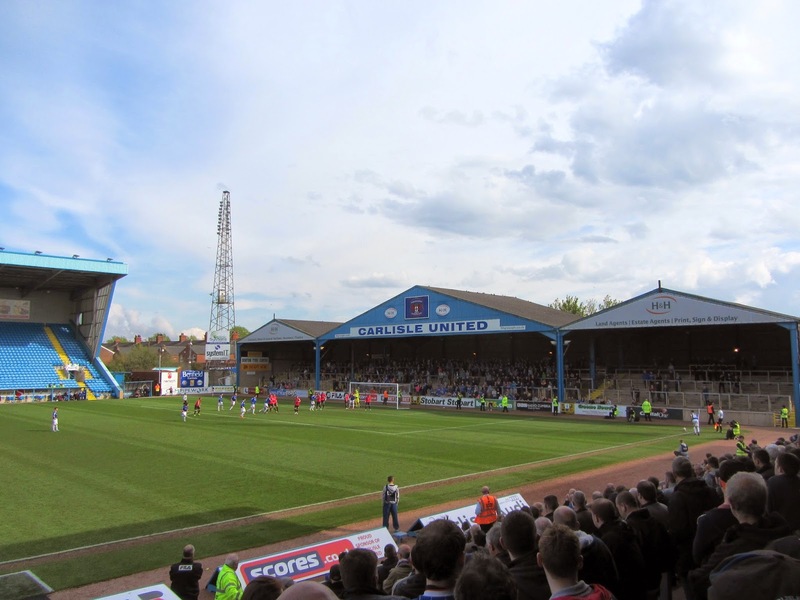 Brunton Park can be found on the edge of a residential area just to the south of the River Petteril. The ground lies 1 mile from Carlisle railway station and has been home to the club since 1909. The venue is dominated by the East Stand - a large cantilever stand built in 1996 which has a capacity of 6,000. This side of the ground is the only side which is all-seater and the northern end of it is usually given over to away supporters. On the opposite side of the pitch there is a mixture of seating and terracing which can also hold a total of 6,000 fans. This consists of the Paddock which is uncovered concrete terracing split down the middle by the tunnel to the interior of the stadium. Built above the terracing is the Main Stand which is split into three sections - the original structure which was built in the 1950s sits in the middle with two wings with additional seating which were added afterwards. The interior of the Main Stand includes the club facilities such as the dressing rooms, ticket office and hospitality areas. The area behind the goal at the southern end of the venue is Warwick Road End. This unusual looking stand has a triangular roof which covers the concrete terracing which can house 3,500 people. The club shop is located directly outside the Warwick Road End. Finally the Petteril End is situated behind the goal at the northern end of the ground and is the smallest area at Brunton Park. This is a narrow section of uncovered concrete terracing with a small seated area towards the eastern end of it. The Petteril End is only fully opened for rare matches where high enough attendances are recorded to warrant the opening. 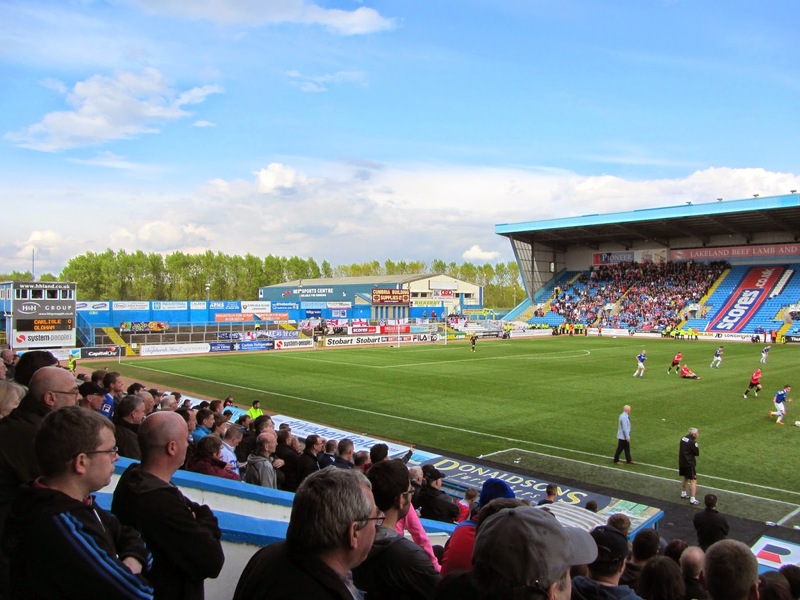 The game was the Carlisle's final home match of the season and they knew that a win was vital if they were to give themselves a chance of staying up. Oldham began the more composed of the two teams and played some good passing football despite not really threatening the home goal. Carlisle went closest when Gary Madine's long range effort was tipped over the bar just before the break. The visitors had the ball in the net around the hour mark as Joel Byrom headed James Wesolowski's cross into the net but as he turned to celebrate saw the offside flag denying Oldham the lead. Shortly after this the visiting side had the ball in the net again and this time it counted - a ball was sent over the drop to James Drayton who easily beat two defenders before poking the ball into the the bottom of the goal. As the game wore on the hosts desperately searched for an equaliser to get a foothold in the game but they lacked quality up front and the wayward finishing meant they could not turn it around. The angry home fans knew as the final whistle went that their chances of staying in League One were very slim and a week later their relegation was confirmed with a 3-0 defeat to Wolves.